Naming rules:Limit of 20 characters; no numbers, punctuation marks or similarly spelled names. No naming after famous/notorious people or famous horses. No vulgar or suggestive names. Family names are traditional, but not required. An (r) denotes a real horse used in the pedigree; (TB) denotes a Thoroughbred; (QH) denotes a Quarter Horse; (AR) denotes an Arabian. 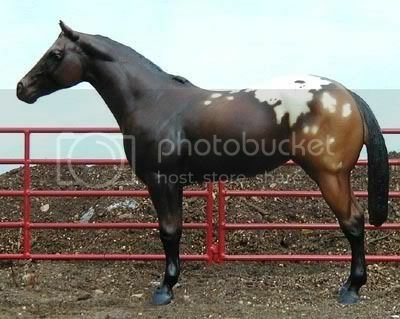 The horses on this page with a Thoroughbred parent are also dual-registered with the Appaloosa Sporthorse Association. 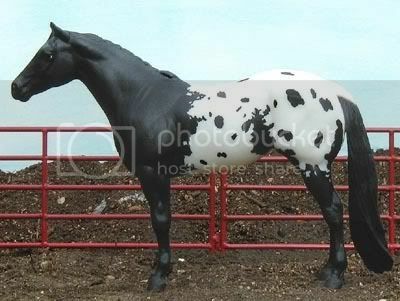 They would be good crosses for race-bred Appaloosas. The Appaloosa Horse Club allows outcrosses to Quarter Horses, Thoroughbreds and Arabian Horses. 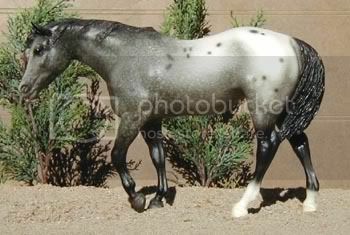 One parent must be a registered Appaloosa, but the other parent can be one of these breeds. 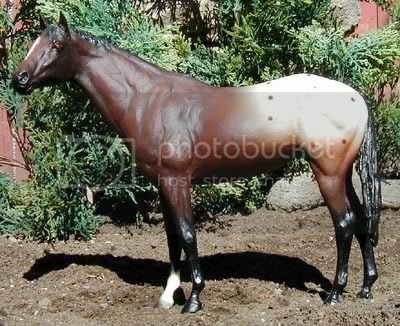 I will allow any other outcross that results in a foal eligable to be registered as a Pony of the Americas, or Appaloosa Sporthorse. Other reasonable outscrosses are allowed from these horses. Click the photo for pedigree information. Model information: Breyer Stablemate scale G2 Trotting Foal mold; #5982 Stablemates Fun Foals Gift Pack; produced 2002-2006. 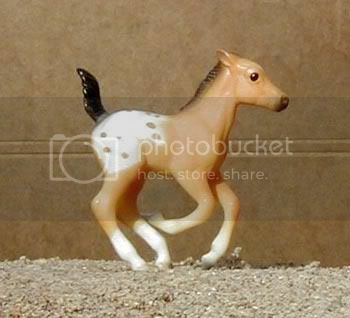 Model information: Breyer Stablemate scale G2 Trotting Foal mold; #5303 Dude Ranch Play Set; produced 2001-2005. 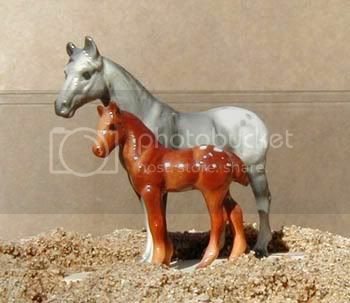 Model information: Breyer Stablemate scale G1 Arabian Mare mold; Set of 12 Miniatures set, 1995 JCPenney special run. 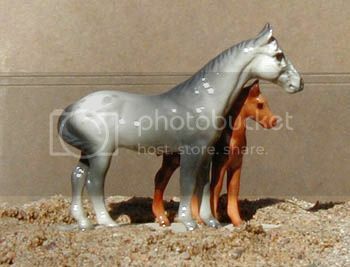 Model information: Breyer Stablemate scale G2 Trotting Foal mold; Horse and Foal set; special run for Target stores in 2006. 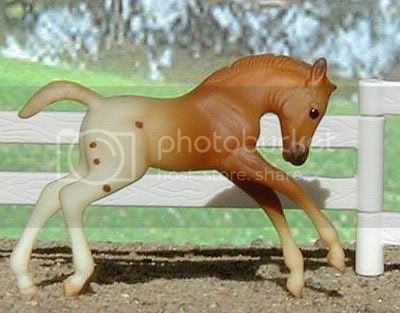 Model information: Breyer Stablemate scale G1 Arabian Mare mold; "Butterscotch," special run for Gotz; 1996. Model information: Breyer Family Arabian Foal mold; #39 "Spot," glossy "big blanket" version, produced earlier part of 1963-1971. Sire has been NAN qualified in halter and performance. Lines to Buckpasser[TB]. 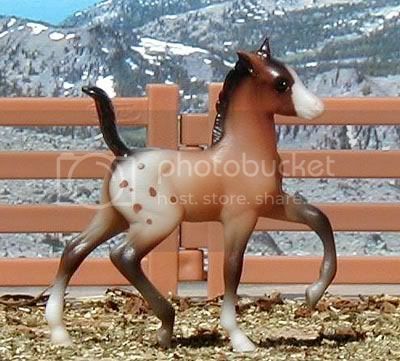 Model information: Breyer Stablemate G1 Standing Thoroughbred Foal mold; 12-Piece Stablesmates Gift Set, special run for the 1998 Sears Wish Book. Lines to Waps Spot 2, Buckpasser[TB], War Admiral[TB]. 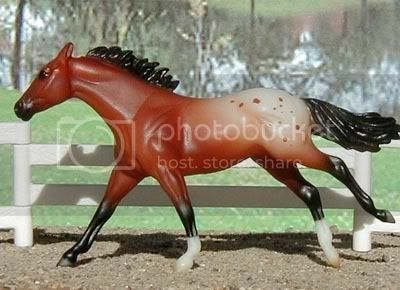 Model information: Breyer "Secretariat" mold; "King of Hearts" Breyer Tour Model, produced in 1997. Lines to Slew O'Gold[TB], Seattle Slew[TB], Sir Ivor[TB], Fair Charles. Dam is a multi champion/grand champion. 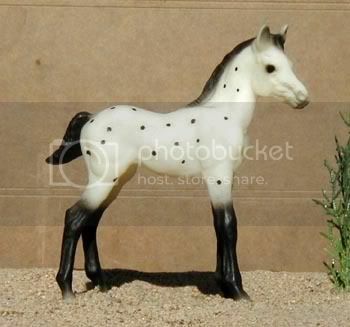 Model information: Hagen-Renaker mini/Postage Stamp Appaloosa Mare and Foal; dates unknown/discontinued. 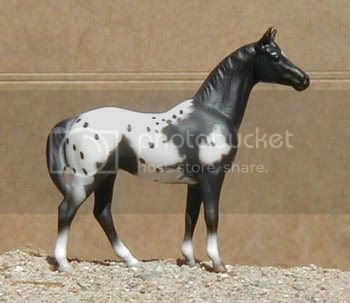 Model information: Hartland 9 inch Polo Pony mold, special run "Chart the Course.". Sire and dam are photo show placed. Lines to Storm Cat[TB], Palace Music[TB]. 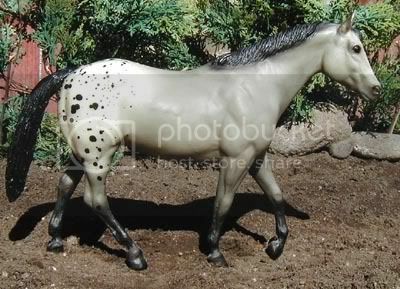 Model information: Breyer Stablemate G2 Scampering Foal mold; #59975 Appaloosa Mare and Foal set, produced 2000-2002. Sire and dam are photo show placed. Lines to Banqueroute[TB]. 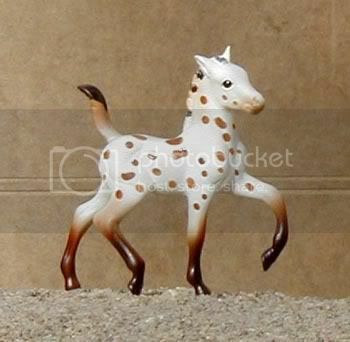 Model information: Breyer Stablemate G2 Cantering Foal mold; #5655 Stablemates Fun Foals Gift Set, produced 2000-2001. Lines to Sleepy Native, Native Born[TB], Little Current[TB], Sea Bird[TB]. 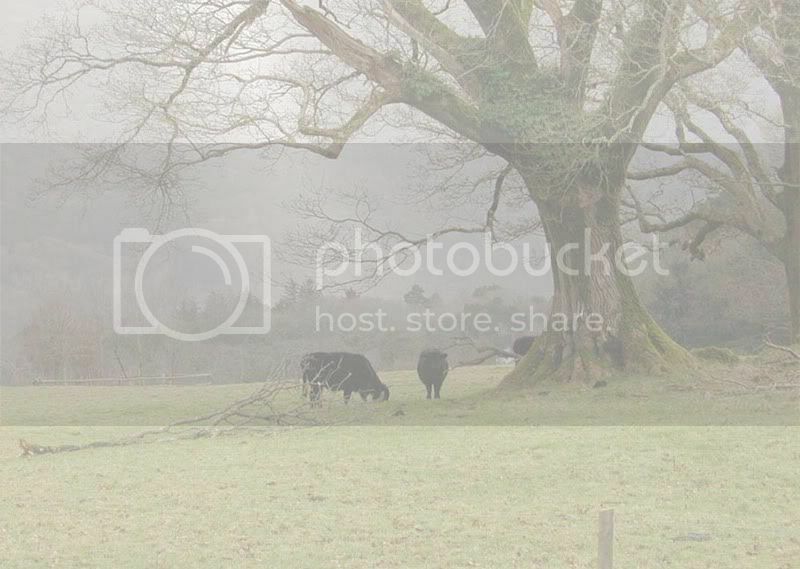 Awards: Photo show placed, NAN qualified. 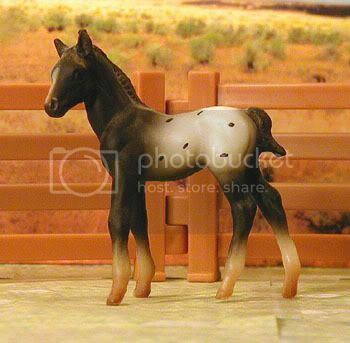 Model information: Breyer Stablemate G2 Cantering Foal mold; #5993 Pocket Barn Carry Case set, produced 2002-2004. Lines to Easy Goer[TB], Alydar[TB], Little Current[TB], Goer. 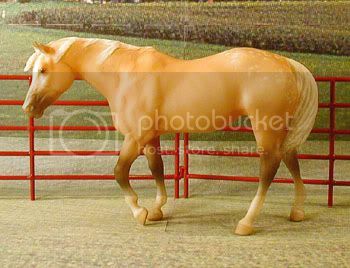 Model information: Breyer Stablemate G1 "Citation" mold; 12-Piece Stablemates Set, special run for the JCPenney Christmas catalog in 1996. Lines to Dreamfinder, Seattle Slew[TB], Weber City Miss[TB]. 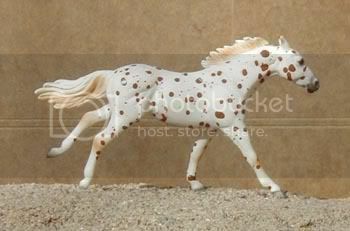 Model information: Breyer Classic scale "Duchess" mold; #62005 Appaloosa Mare and Foal - Dun, produced 2005-current. Lines to Bold Bidder[TB], Pleasant Colony[TB]. Sire is a live show champion, dam is live show placed. 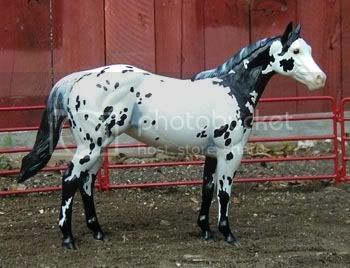 Model information: Breyer Stablemate G2 Thoroughbred, custom etched/painted by owner. Lines to Rowdy Blue Man[QH], Buckpasser[TB], Chief of Fourmile, Swoon's Son[TB]. 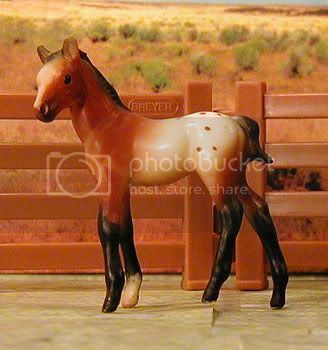 Model information: Breyer Stablemate G2 Thoroughbred mold; #59975 Appaloosa Mare and Foal, produced 2000-2002. Half sister to Cigar[TB]; Lines to The Minstrel[TB], Northern Dancer[TB], Prince John[TB], Docs Benito Bar[QH], Alias King, Bendi Charge. Model information: Breyer Stablemate G1 "Citation" mold; Set of 12 Miniatures, special run for the JCPenney Christmas catalog in 1995. Half sister to Cigar[TB]. Lines to The Minstrel[TB], Northern Dancer[TB], Prince John[TB], Bugs Alive in 75[QH]. 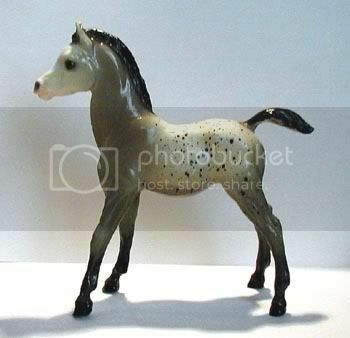 Model information: Breyer Stablemate G1 "Swaps" mold; #5650 Saddle Club Stablemates Collection, produced 1996-1997. Lines to Acclaim, Prince Plaudit. Model information: Breyer Stablemate G1 "Swaps" mold; #10304 Hidalgo Stablemates Mustang Play Set (from the Hidalgo movie), special run for Blockbuster stores in 2004. Lines to Wild Zip, Night Deck, Bold Moon[TB]. 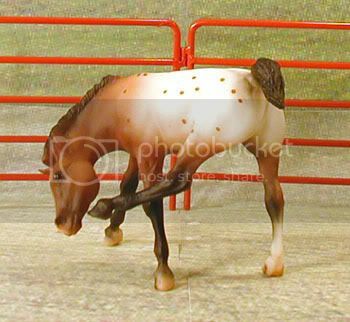 Model information: Breyer Stablemate G1 Standing Foal mold; #59973 Appaloosa and Foal, produced 1997-1999. Lines to Absarokee Sunset, Three Bars Queen, Three Bars[TB], Bright Eyes Brother. 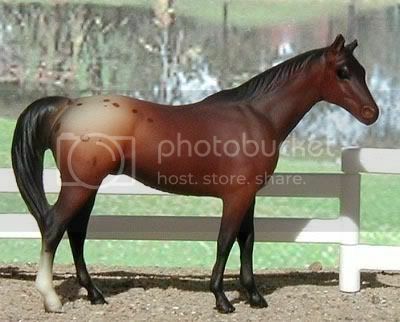 Model information: Breyer Stablemate G2 Thoroughbred #59979 Horse and Foal Gift Set, produced 2003-2006. Lines to Secretariat[TB], Bold Ruler[TB], Nasrullah[TB], Ima Doc O'Lena, Doc O'Lena[QH], Doc Bar[QH]. 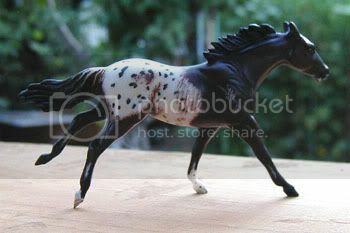 Model information: Breyer Stablemate G1 "Silky Sullivan" mold; 12-Piece Stablemates set, special run for the 1996 JCPenney Christmas catalog. Lines to Chief Of Fourmile (winner of many races and in the ApHC Hall of Fame), Swoon's Son[TB], Nasrullah[TB]. 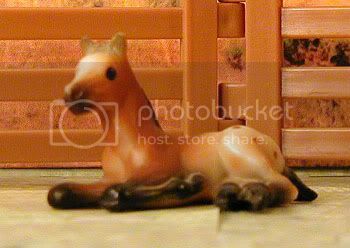 Model information: Breyer Stablemate G1 Lying Thoroughbred Foal mold; 12-Piece Stablesmates Gift Set, special run for the 1998 Sears Wish Book. Lines to Go Concord[QH], Slew O'Gold[TB], Fair Charles. Granddam is a multi Champion/Grand Champion. Lines to Dreamfinder, Alias King, Alias Smith And Jones, Majestic Dell[QH], Quo Vadis[QH], High Sign Nugget, High Sign, High Time, High Spot. 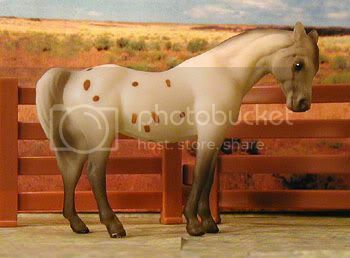 Model information: Breyer "Lady Phase" mold; #1248 Stock Horse Treasure Hunt, Appaloosa, long tail version, produced 2006. Lines to Stud Spider, Old Pueblo[TB], Ariel[TB], Wapiti, Bear Cat[QH], Prince Plaudit. 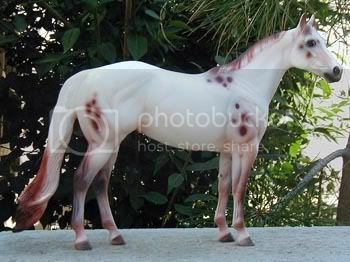 Model information: Stone Horses Ideal Stock Horse mold; special run for the 2005 Life's A Beach live show in California. This is one of 10 Judge's Models from the show. Lines to Prince's Jim, Prince Plaudit, Sonny's Jane Domino, Kelley's Sonny Boy, Dial Bright Too, Dial Good[QH], Mighty Bright, Duke's Diablo[QH]. 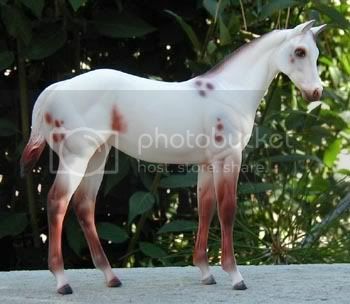 Model information: Stone Horses Weanling mold; E-Horse special run "April's Foal," only available through Stone Horses' website. Lines to Continental King[QH], King[QH], WOA Sarcees Candy, Navajos Candy, Chief Navajo. 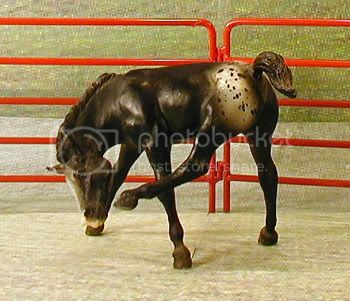 Model information: Breyer Scratching Foal mold; , produced 1970-1986. Lines to Dreamfinder, Alias King, Alias Smith And Jones, Majestic Dell[QH], Quo Vadis[QH], Oughta Be Obvious, Obvious Conclusion[QH], Conclusive[QH]. 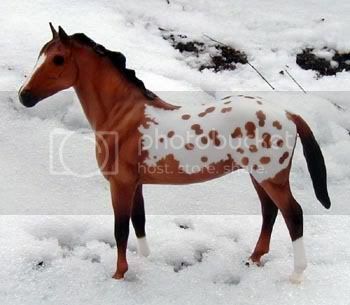 Model information: Stone Horses Ideal Stock Horse mold; special run for the Haynet Yahoo! group in 2005; glossy version. Lines to Cee Bee Command[QH], Fritz Command[QH], King Fritz[QH], Mr Gun Smoke[QH], Cutter Bill[QH], King[QH], Sir Wrangler, Prince Plaudit, Go Bay Go. 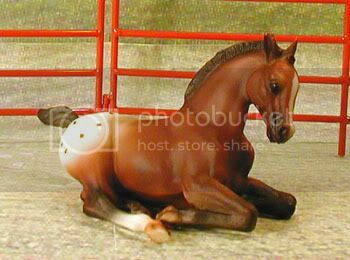 Model information: Breyer Lying Down Foal mold; "Buster and Brandi" Twin Foals set, special run for Breyer's magazine Just About Horses in 1995; 2,000 made. Lines to Streakin Six[QH], Easy Six[QH], Easy Jet[QH], Jet Deck[QH], Docs Wrangler[QH], Doc Bar[QH], War Leo[QH], Leo[QH], Doc Olena[QH], Dandy Zippo, Zippo Pine Bar[QH], Docs Fox. 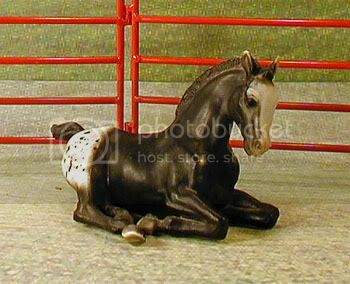 Model information: Breyer Lying Down Foal mold; #165 Lying Down Foal, produced 1969-1984. Lines to The Executive, Dial Bright Too, Bright Luster, Ribbons Heart Beat[QH], Ribbon Page, Prince Plaudit, Its A Girl Bug, Romans It Girl. 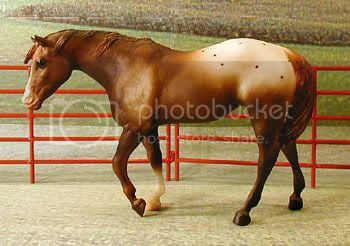 Model information: Breyer Scratching Foal mold; "Buster and Brandi" Twin Foals set, special run for Breyer's magazine Just About Horses in 1995; 2,000 made. Lines to Prince's Jim, Prince Plaudit, Sonny's Jane Domino, Kelley's Sonny Boy, Dial Bright Too, Dial Good[QH], Mighty Bright. 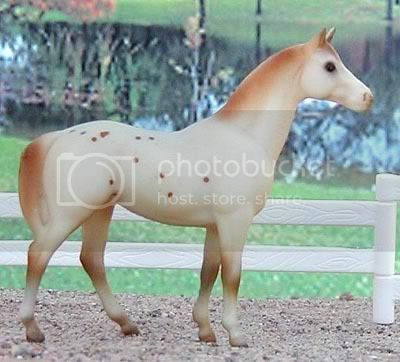 Model information: Stone Horses Ideal Stock Horse mold; E-Horse special run "April," only available through Stone Horses' website. Lines to Johnny Luck, Bright Eyes Brother, The Signature[QH], Noholme II[TB]. Awards: Live show placed in collectibility; has achieved Champion status with IMEHA. 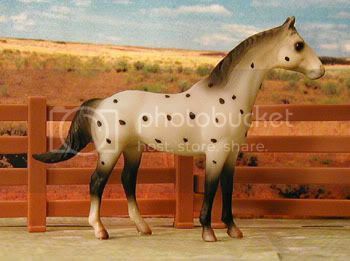 Model information: Breyer "Lady Phase" mold; portrait of "Breezing Dixie" Famous Appaloosa Mare, 1988 Limited Edition, early version with hand-painted "battleship gray" hooves. Lines to MR San Peppy[QH], Easy Jet[QH]. 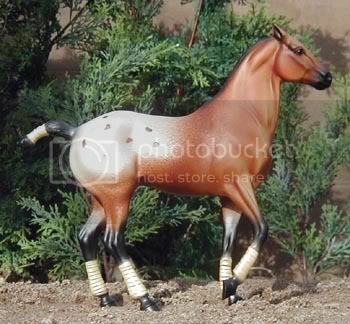 Model information: Breyer Indian Pony mold; #701796 "Halayi,", special run for State Line Tack stores in 1996. Lines to Royal King[QH], King[QH], Ima Doc O'Lena, Doc O'Lena[QH], Doc Bar[QH], Poco Lena[QH], Wa Jo's Freckles, Sheza Good Sport. 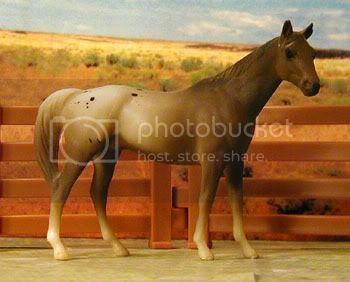 Model information: Breyer Indian pony mold; "Prairie Song", special run for the 2001 West Coast Model Horse Collector's Jamboree; 1,300 made. Lines to Doc Bar[QH], Jaguar[QH], Custus Rastus[TB], Alias King, Alias Smith And Jones, Leon Bars[QH], Bendi Charge, Rustler Charger, Navajo Britches. 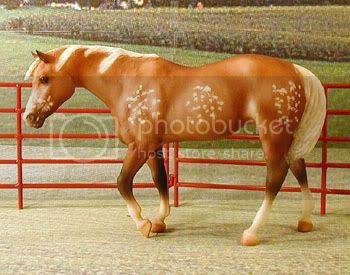 Model information: Breyer Stock Horse Mare mold; Stock Horse Family, special run for Sears Wish Book in 1983. 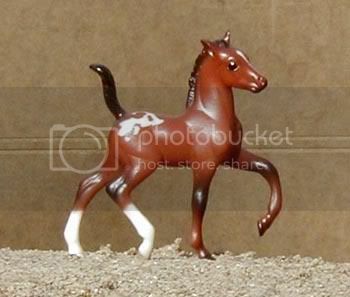 Model information: OF Breyer Classic scale Mustang Foal mold, special run. Lines to Bright Eyes Brother, Peppy San Badger[QH]. Dam's sire was a multiple photo/live show champion/reserve in the 90s, and sire of champion showers and broodmares. Dam's dam is a NAN Top Ten in halter. 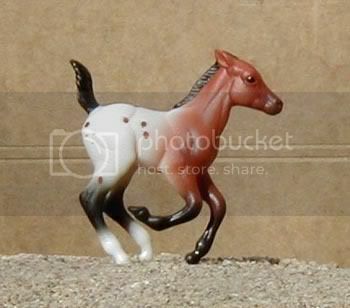 Model information: Breyer Indian Pony mold; #986 "Full Speed," Appaloosa, produced 1997-1998. Lines to Mr. Silver, Silver Thistle[TB], Peppy San Badger[QH], Easy Jet[QH]. 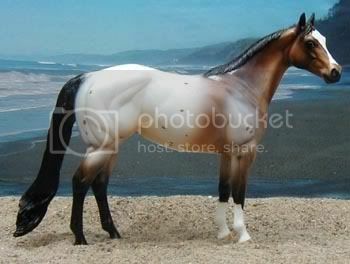 Sire was a multiple photo/live show champion/reserve in the 90s, and sire of champion showers and broodmares. Dam is a NAN Top Ten in halter. 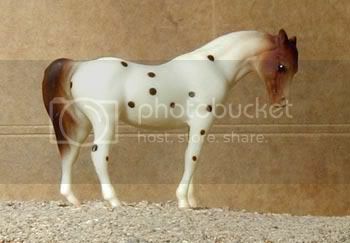 Model information: Breyer Indian Pony mold; #764 Appaloosa Mare, produced 1999-2001.